Next-level healthcare … a control monitor being used during a heart catheterization at Heidelberg University Hospital, Germany. What makes a good doctor? When the British Medical Journal asked the question in 2002, common qualities that resonated with its readers were compassion, understanding, empathy, honesty, competence, commitment and humanity. That was a time before Facebook, Google, Siri, AlphaGo and the rise of AI and algorithms to analyze complex medical data. But despite these impressive advances, in challenging times we still expect such profoundly human qualities in our health professionals. And in situations like end-of-life care, it is almost impossible to imagine compassionate service delivered in a hospice staffed by algorithms. So doctors will not be replaced by AI. But it is almost certain that doctors who use AI will replace doctors who do not use AI. What knowledge and skills will be needed by such a workforce? Better technical and computational skills will definitely be required – something that has already been recognized in academic medicine. For example, at the end of last year, Genomics England reached its goal of sequencing the DNA of 100,000 NHS patients, but organizing and analyzing those data for biological and medical insights requires doctors and scientists with advanced computational skills. Universities across the world now provide such training through clinician-scientist programmes and online courses such as sysMIC, created by UCL and a consortium of universities including the Open University, Birkbeck and the University of Edinburgh. But AI represents a still broader challenge. A narrow set of computer science skills are unlikely to be sufficient; the deployment of AI within the NHS requires a range of expertise in data analytics and algorithms. And we already know enough about the impact of AI in the real world to appreciate that working with it will require an expansive set of skills – from ethics, information governance, policy and regulation to social science, an understanding of the graphic arts, industrial design, cognitive neuroscience and many others. Only such a comprehensive remit will allow the appreciation of the social applications and social implications of AI essential for its successful integration into medicine. The UK is increasingly recognizing the need for such a range of skills. This month saw the publication of a review commissioned by the minister for health and social care and led by Eric Topol, an American cardiologist, geneticist and digital medicine researcher. It identifies what might be needed for the NHS workforce to deliver a digital future, including AI. The necessary scale of transformation should not be underestimated – with over 1.2 million staff, the NHS is one of the largest employers in the world. Yet staff currently receive little or no training in this area. For example, radiology is highly likely to be affected by the development of AI technology for reading mammograms or brain scans. Yet the 2016 curriculum produced by the Royal College of Radiologists that specifies how radiologists are trained barely mentions such advanced technologies. Instead, it simply notes that radiologists should be able to demonstrate “competent use of relevant computer technology”. 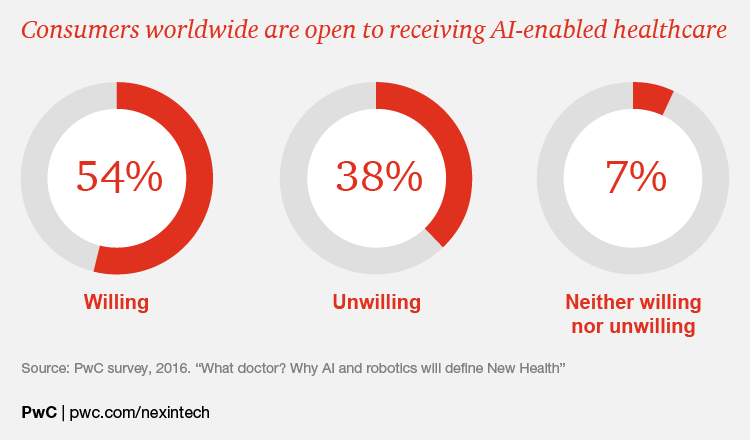 A breakdown of attitudes to AI in healthcare worldwide. Who then will train the AI-using doctors of the future? Universities have a key role to play, because they are the only institutions with expertise spanning the full range of knowledge and skills needed. So do companies that are developing many of the advanced technologies that will be used in AI medicine of the future. Working together in partnership with the NHS and other health services, they can use existing models to deliver clinical academic training programmes which allow doctors to move between healthcare and universities, receiving joint clinical and academic training, sometimes combined with placements in companies. Until today, such programmes did not exist for doctors interested in AI. But as part of a £100 million investment by the UK government to fund 1,000 new PhD places across the UK to create the next generation of artificial intelligence researchers, some universities are beginning to create these opportunities for healthcare scientists and doctors. For example, UCL will create a £6.2 million programme in AI-enabled healthcare systems that has been announced today by UK Research and Innovation. This will enable graduates, trained by world-leading AI researchers and working in NHS organisations, to design adaptive and flexible systems that improve how healthcare organisations operate, delivering personalized and targeted treatments for patients. Such a transformative investment is just a start; the scale and breadth of the training requirement that the Topol review identifies calls for many more and varied approaches across the UK. But today’s investment shows the potential of the NHS, working in partnership with universities and commercial partners, to deliver the AI-using doctors and healthcare professionals of the future.